After the daring rescue of a spider, a young boy named James finds gains possession of some magic crocodile tongues. When James spills them in the garden, out sprouts an enormous peach! Climbing inside, he meets an astonishing cast of characters and embarks on a magical odyssey full of thrills and adventure. Young James climbs inside an enormous peach and meets some astonishing characters in this magical odyssey full of thrills and adventure. Turn up the volume and scream along side your favorite Disney characters. 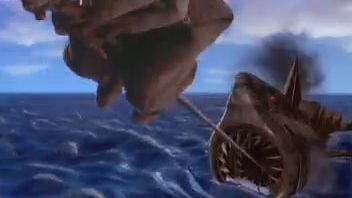 James and the bugs protect the peach and themselves from being eaten by a robot shark in this scene from James and the Giant Peach. 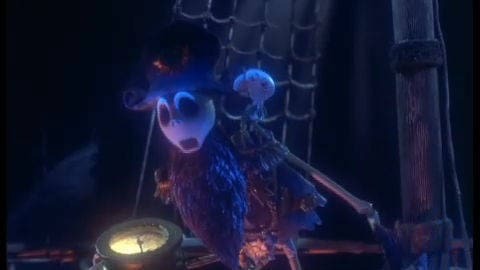 James and the bugs escape the clutches of the skeletal ghost pirates in this scene from James and the Giant Peach. 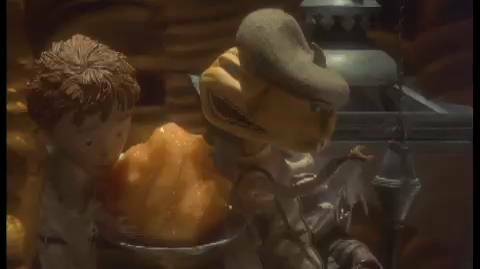 James and the bugs have a peachy time enjoying a meal in this scene from James and the Giant Peach. Never Land's Captain Hook sets in motion a trap for Peter and Tink, leaving Jane, Wendy's daughter, to save them!